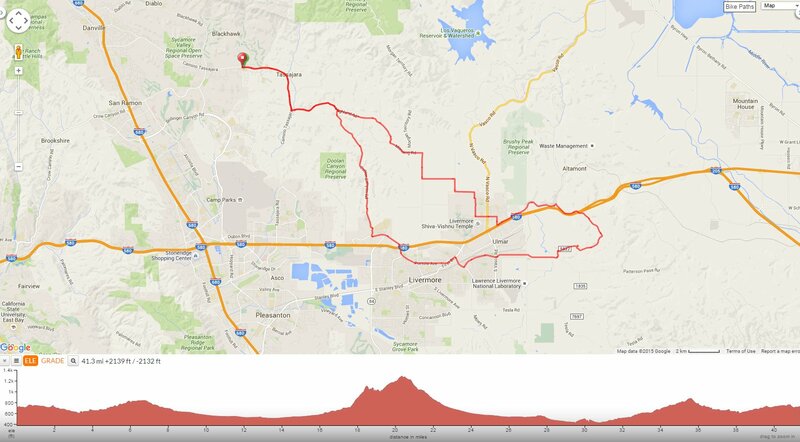 This ride heads east from Danville into Livermore Valley for short loop through the Altamont wind farms from Carroll Rd and N Flynn Rd. Drop down into the open valley onto Patterson Pass Rd and return west on Portola Ave for the scenic run along Collier Canyon back to Highland Rd and Camino Tassajara. Exit Diablo Vista onto Camino Tassajara; this road heads south out of town towards the back country with wide open pastoral ranch lands and rolling hills through the unincorporated town of Tassajara to Highland Rd. Highland Rd travels east on gentle rolling terrain through “horse country” with boarding ranches and training facilities. The beautiful hills are dotted with grazing cattle and scattered barns. At the Y intersection, stay on Highland for the short climb up and over into the valley. The road drops down from the Contra Costa County line into Alameda County at Manning Rd. The flat terrain on Manning and N Livermore leads out through the beautiful expansive Livermore Valley. Meander around the flat valley floor on May School to Dagnino and Raymond Rd. The open valley landscape offers splendid views of the soft rolling hills and country ranches. Cut through the residential neighborhood on Broadmoor and Scenic to Herman and Northfront Rd. Continue east on Altamont Pass Rd past the popular Club Moto Motorcross tracks along I-580; the gentle terrain goes under the train trestle and follows the old RR tracks up to Carroll Rd. The road drops down into Livermore Valley from the hilltop ranch onto Patterson Pass Rd. Patterson Pass Rd continues down across the valley into Livermore. Continue west on First St to Portola Ave; the road rolls through the residential neighborhoods around north Livermore and crosses over I-580 to Las Positas College and the newer developments along the upper ridge. Collier Canyon Rd continues on flat gentle rolling terrain for the next 5.5 scenic country miles to the north end at Highland Rd; the road crosses into Contra Costa County towards Sycamore Valley with minimal to no traffic. Collier Canyon Rd cuts through Livermore Valley from the south end at Portola Ave in Alameda County to the north end at Highland Rd in Contra Costa County. These open ranch lands are populated with a few working cattle ranches and a large horse boarding facility. At the intersection with Carneal Rd, Collier Canyon climbs gently for about a mile with grades of 2-4.5% up to the old water tower and windmill. The fast descent drops down to the junction with Highland Rd. At Highland Rd, reverse your way back out to Camino Tassajara to the suburban neighborhoods around Diablo Vista. This is a wonderful scenic ride through the quiet less-traveled country back roads around Livermore Valley. The flat-rolling terrain keeps the legs spinning during these cool autumn days. Weather: Sunny and cool with clear blue skies. Temps ranged from the low 40’s to the low 50’s with brisk NE winds. Yikes! We Californians think it’s COLD when the temps dip to the low 30’s and 50’s!